Germ cell epigenetics is a critical topic in plants and animals. 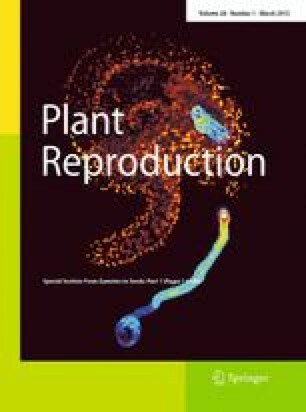 The male gametophyte (pollen) of flowering plants is an attractive model to study genetic and epigenetic reprogramming during sexual reproduction, being composed of only two sperm cells contained within, its companion, vegetative cell. Here, we describe a simple and efficient method to purify SYBR Green-stained sperm and vegetative cell nuclei of Arabidopsis thaliana pollen using fluorescence-activated cell sorting to analyze chromatin and RNA profiles. The method obviates generating transgenic lines expressing cell-type-specific fluorescence reporters and facilitates functional genomic analysis of various mutant lines and accessions. We evaluate the purity and quality of the sorted pollen nuclei and analyze the technique’s molecular basis. Our results show that both DNA and RNA contents contribute to SYBR Green-activated nucleus sorting and RNA content differences impact on the separation of sperm and vegetative cell nuclei. We demonstrate the power of the approach by sorting wild-type and polyploid mutant sperm and vegetative cell nuclei from mitotic and meiotic mutants, which is not feasible using cell-type-specific transgenic reporters. Our approach should be applicable to pollen nuclei of crop plants and possibly to cell/nucleus types and cell cycle phases of different species containing substantially different amounts of DNA and/or RNA. The online version of this article (doi: 10.1007/s00497-015-0258-2) contains supplementary material, which is available to authorized users. We thank Gabriele Stengl and Gerald Schmauss from the BioOptics Facility for setting up and optimizing FACS, and Nicole Fellner and Günter Resch from the Campus Science Support Facility for electron microscopy. We thank Georg Krohne for advice and suggestions. We thank Sheila McCormick for an AtGEX2:eGFP transgenic line, and Marjorie Matzke for nrpe1 and drd3-1 seeds. VKS thanks Marc Berlinger for his support. This work was supported by Austrian Science Fund (FWF) Grants P21389-B03 and P24918-B21 (to H.T. ).